A pre-dawn fire that nearly destroys the colonial city of Boston. A young witch in the town of Dedham who harbors a terrible secret. A magick-laden blade for which otherwise sane men might kill. A perilous encounter with Boston’s most notorious thieftaker, the lovely and cruel Sephira Pryce. And, at last, the true story of the bloody mutiny aboard the privateering ship Ruby Blade. These are but a few of the stories included in this collection of short fiction from award-winning author D.B. Jackson. 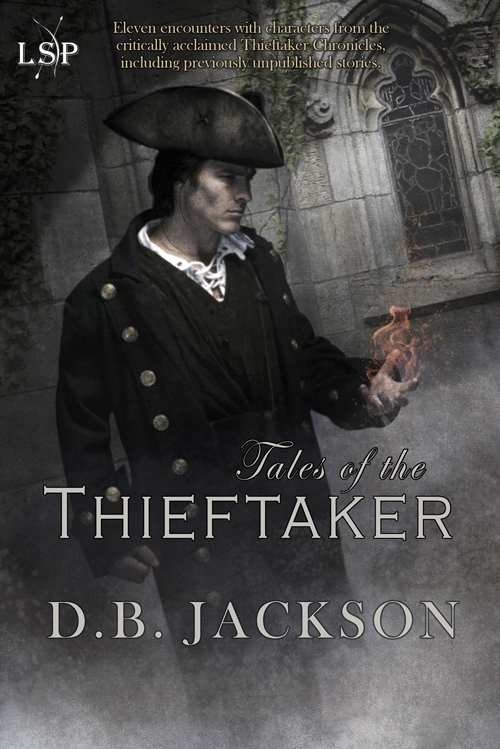 Tales of the Thieftaker returns readers to 1760s Boston and the exploits of Ethan Kaille, thieftaker and conjurer. Walk back in time to a city whose taverns serve Kent ales and rum flips, and whose streets are marched by revolutionaries, patrolled by British soldiers, and prowled by thieves, conjurers, and murderers. Some of the stories in the collection were originally published elsewhere and are reprinted here in a single volume. Others have never been published before. Most notably, the volume includes “The Ruby Blade,” a full-length novella that at long last relates the story of the Ruby Blade mutiny, for which Ethan was court-martialed and imprisoned for fourteen years.